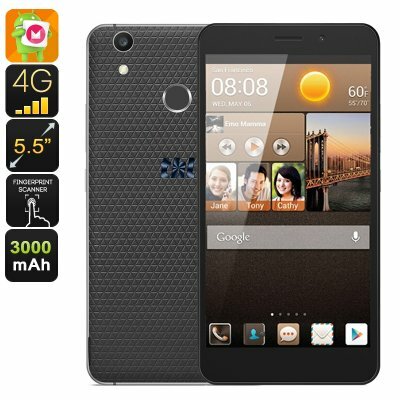 Successfully Added THL T9 Plus Android Smartphone - Android 6.0, 5.5-Inch Display, Dual IMEI, 4G, Quad-Core CPU, 2GB RAM, 3000mAh (Black) to your Shopping Cart. The THL T9 Plus is a remarkably slim and well-designed Android smartphone that features a beautiful design from the outside and packs some serious hardware within. Running on an Android 6.0 operating system, this Chinese smartphone comes packed with the latest features the industry has to offer – allowing you to enjoy an exceptionally smooth and powerful user experience. Along with its 5.5-Inch HD display, this Android phone provides you with stunning visuals that let you enjoy all your media, games, and applications to their absolute most. Play graphically intensive games, watch HD movies or simply browse the web – whatever you use this beautiful smartphone for, you will be treated with stunning detail and vivid color. Holding two SIM card slots and featuring Dual-IMEI numbers, this Dual-SIM smartphone provides you with connectivity like no other. Efficiently separate work and private life by using merely one device or throw in a local SIM card while traveling abroad to enjoy local data prices while, simultaneously being able to stay in contact with friends and family back home on your old and trusted phone number – the THL T9 plus will take your connectivity to the next level. Additionally, this Android smartphone also supports 4G networks, allowing you to enjoy the fastest data speeds out there no matter where you’re located. Browse the web, download media, stream online movies, and engage in online video calls – with this Chinese smartphone, you’ll always be connected. Packing a powerful Quad-Core CPU that has been clocked at 1.3GHz and 2GB of RAM – the THL T9 Android phone is capable of handling the most demanding multitasking sessions, graphically intensive games, heaviest mobile applications and a whole lot more. No matter what you throw at this 5-Inch smartphone, nothing will slow it down. Packing 16GB of internal storage and providing you with the possibility to add another 128GB of memory externally – this dual-SIM smartphone holds enough storage for you to store all your favorite media, games, and applications alike – allowing you to enjoy countless hours of mobile entertainment at any time of the day. Simply head out to the play store and install one of the millions free to download applications – with the THL T9 your possibilities for mobile entertainment will truly be limitless. At the back of this sleek Android phone, you will be able to find a state of the art fingerprint scanner that helps you the secure all your files as well as a sophisticated 8MP camera that allows you to snap beautiful pictures and HD footage of all your upcoming adventures. Whether you spent an evening out with your friends or are enjoying a hiking trip while traveling abroad – with this 8MP camera in your pocket you’ll be assured that not a single special moment in life passes by uncaptured. The THL T9 Plus comes with a 12 months warranty, brought to you by the leader in Android smartphones as well as wholesale electronic gadgets..